Recently, Linda Cole (Saiya-chan) of Oranda no Kitsuke created a very nice pattern for making your own stretch tabi. You can download the pattern here. The pattern is for making size 25-25.5cm stretch tabi, however it is easy to make size adjustments by adjusting your print margins. To make your own pair of stretch tabi using Saiya-chan's pattern, simply cut out your stretchy fabric (reverse the pattern for the other foot) and sew the pieces together (inside out) matching up the letters on the pattern pieces. I used a zigzag stitch on my sewing machine, but you can also sew the tabi by hand. 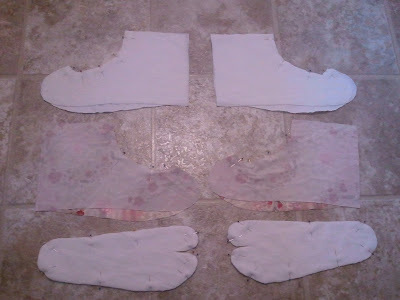 Step 1, Cut out your fabric. Reverse the pattern for the other foot. 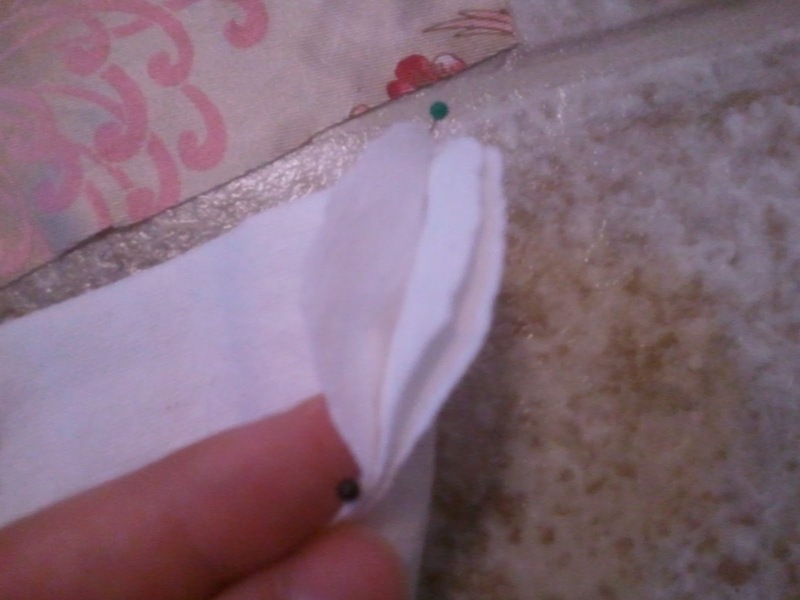 For the outside layer I am using very satiny fabric that is a mix of nylon and polyester. 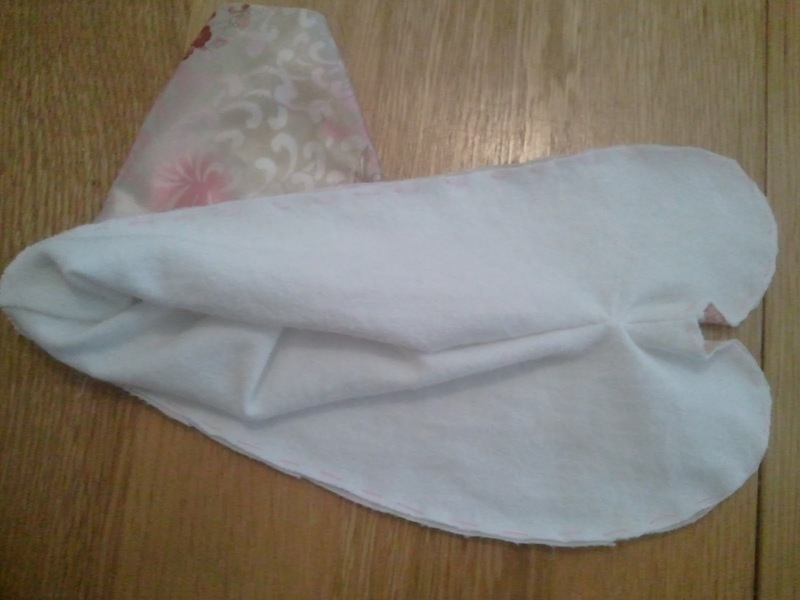 For the lining I used an old jersey cotton T-shirt. 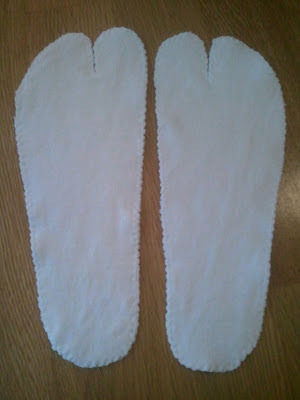 The tabi soles are also jersey cotton, but I used 3 layers of fabric to give the soles cushioning thickness. Step 2, baste the soles together. 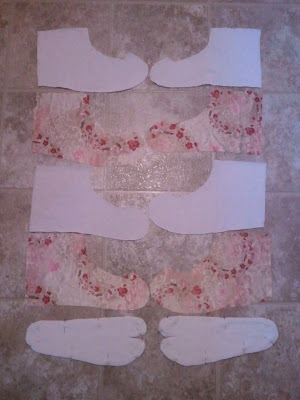 Pin the three layers of fabric for the sole together so that they do not separate. Stitch around the outside of the sole to bond the layers together. 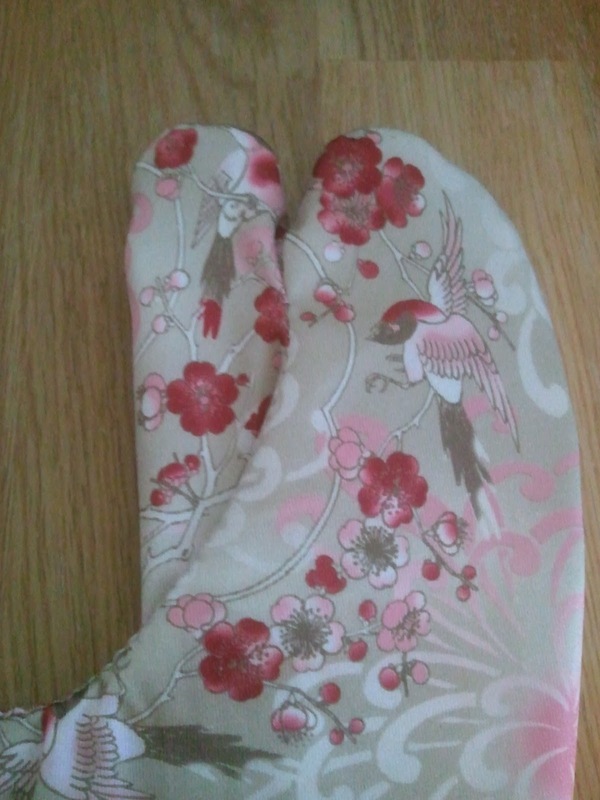 You can use whatever sort of stitch you prefer for this, such as hand basting, machine basting stitch. 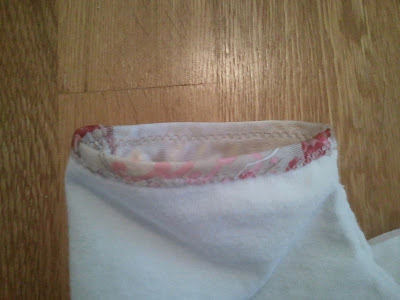 I used a zigzag stitch around the very edge of the fabric. Pin the left and right halves of the tabi and tabi lining together and sew them together. Again, I used a zigzag stitch. Sorry, I don't have a picture for this step. With right sides together still, sew up the back of the heel of each of the tabi and lining pieces. 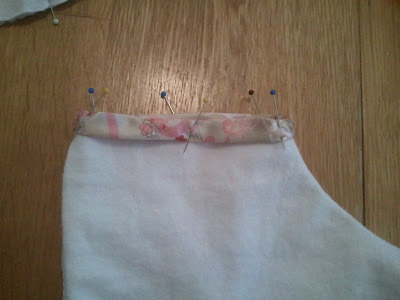 Step 5, Attach the lining to the tabi body. 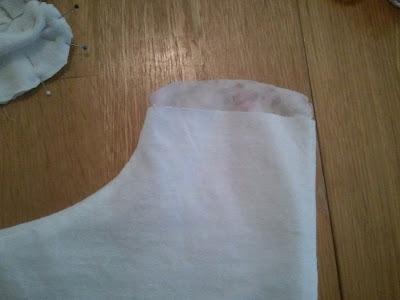 Turn the tabi body right-side out and carefully insert the lining into the tabi body. Line up the toes and pin around the edges. Baste around the edge to bond the tabi and lining pieces. I basted by hand this time. Step 6, Attach the sole. Pin the sole to the body of the tabi, starting from the heel. Use plenty of pins around the toes. The toes are wider on the body piece than the sole, however everything should line up if you focus on keeping the edges even. Again, I used a zigzag stitch. 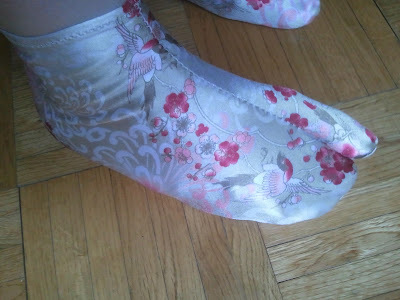 Step 7, Sew the ankle opening (point A on the pattern). To cut down on bulk around the ankle, I trimmed the lining a little bit. Fold the top of the ankle twice and pin it down. You can sew it however you wish. I used a zigzag stitch again for this. 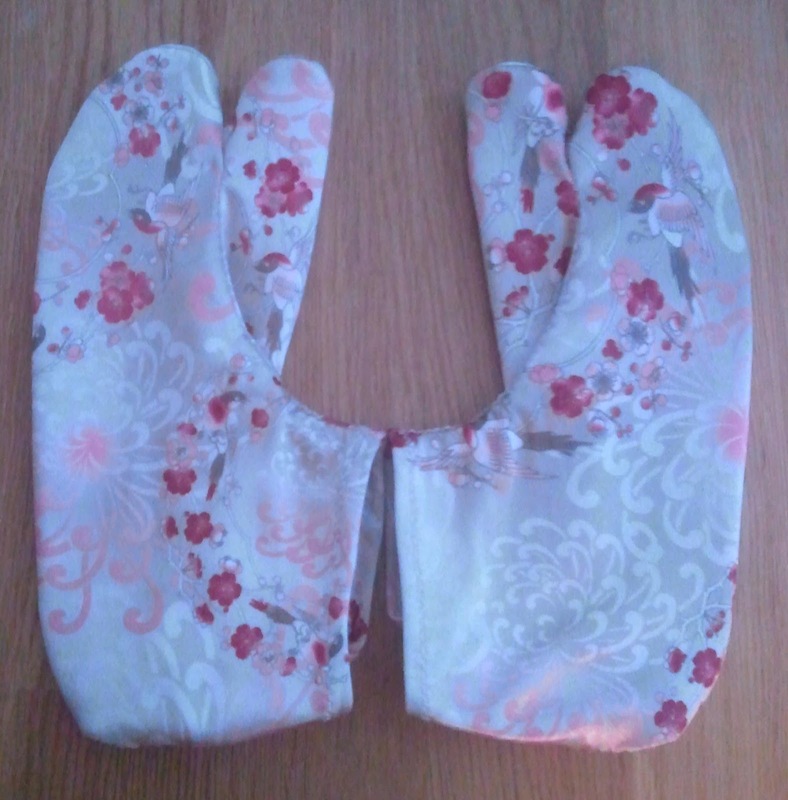 It can be seen on the outside of the tabi, however a zigzag stitch is less likely to break when the tabi is stretched while inserting your foot. You may add a piece of elastic in the ankle opening if you want, but I don't see the need for it. Done! Turn the tabi right-side out, and you are finished! The color on these photos didn't turn out right. The tabi are gold colored and shiny. You can have fun using different types of stretchy fabric and old clothing! Looks great. But I can't make the edges match up. There's more toe material than sole. I'm stumped. The toes are the hardest part. 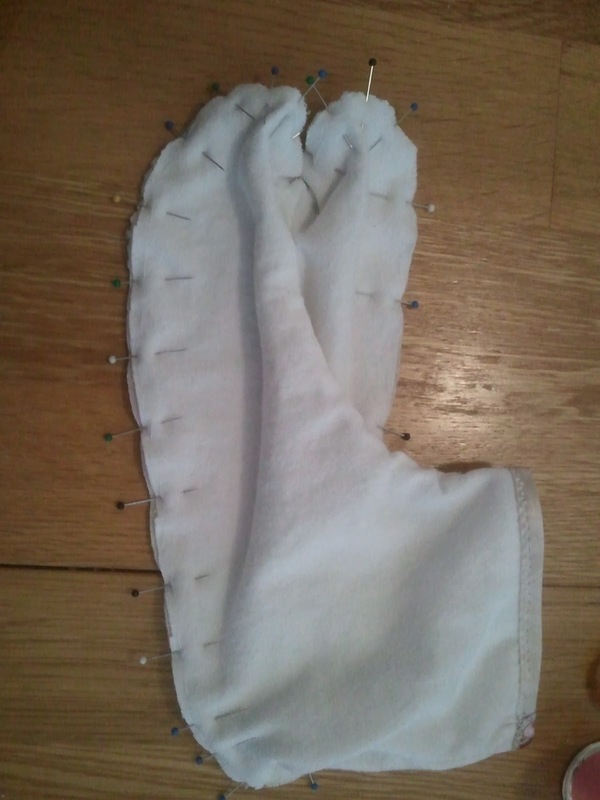 I pin the toes together starting from the center and work outwards, lining up the edges. 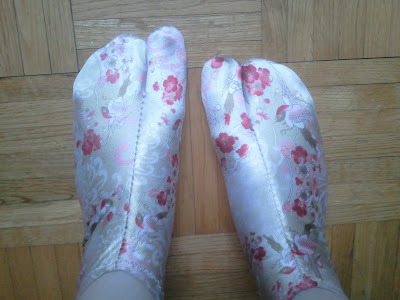 This will result in the top fabric of the toes bunching up because of the extra width of the top-toe pieces. You want that bunching of excess fabric, because that will help your toes fit in the tabi without too much of the sole piece being visible. However, that extra bunching of fabric makes it more difficult to sew around the toes without accidentally sewing puckers, so hand stitching a basting stitch around the sole helps hold everything together better, and you can remove the pins before machine sewing the sole. My problem so far has been those puckers. Or I end up with a huge dart, and that's even worse. I caught on to the trick of it. Thank you! 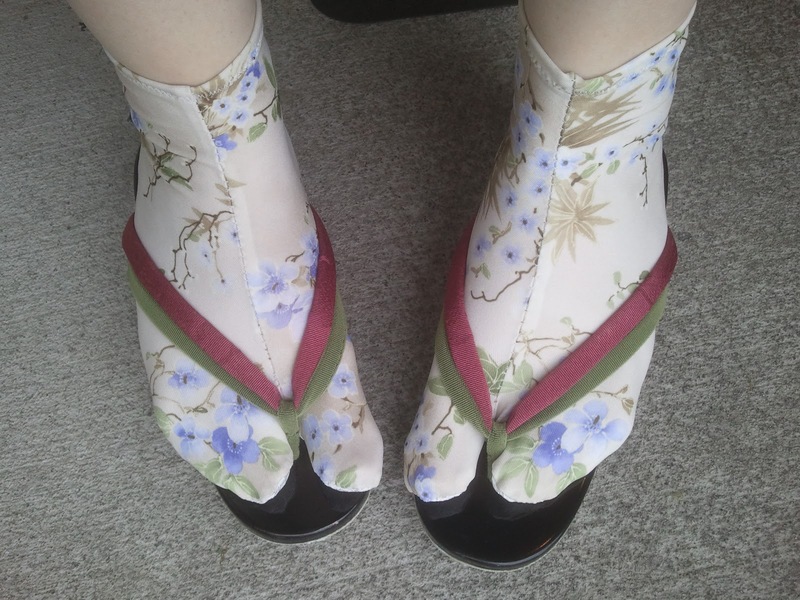 So You Want to Make a Kimono?